I adopted a dog on September 22nd. According to the shelter, her and her littermates were born 7/7/18. 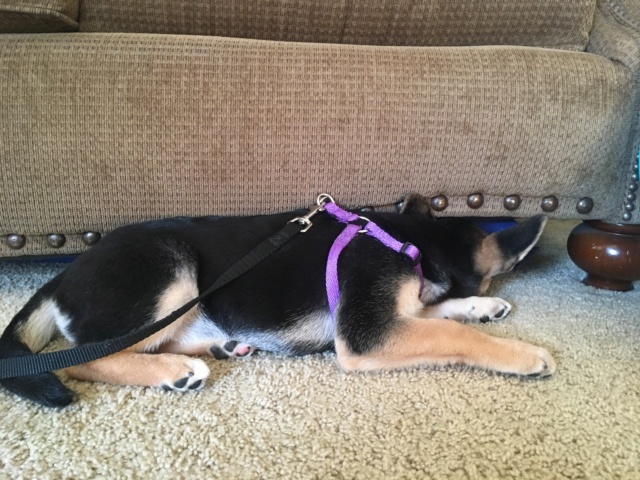 So she is 13 weeks. 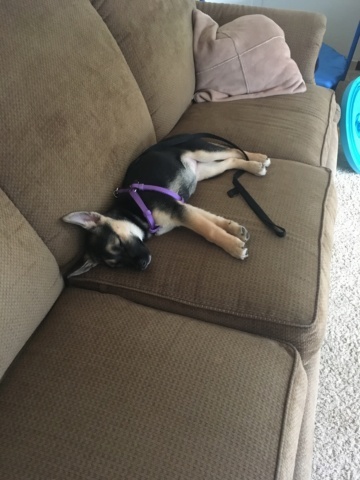 Now... I’m not sure if she is a husky mix... she was labeled a Shepard mix. However she is very petite. At her 12 week appointment she was 9.88 lbs. up from 8.89 lbs when at the shelter at 11 weeks. Her coat is very sleek on her face and then kinda puffy on her neck... then wavy on her back. She obviously is Black and Tan. Her paws grow proportionally with her body and seems to be in a growth spurt. She stands 12” tall and is quite long. She is so slender like a cat. Could she be a husky mix? 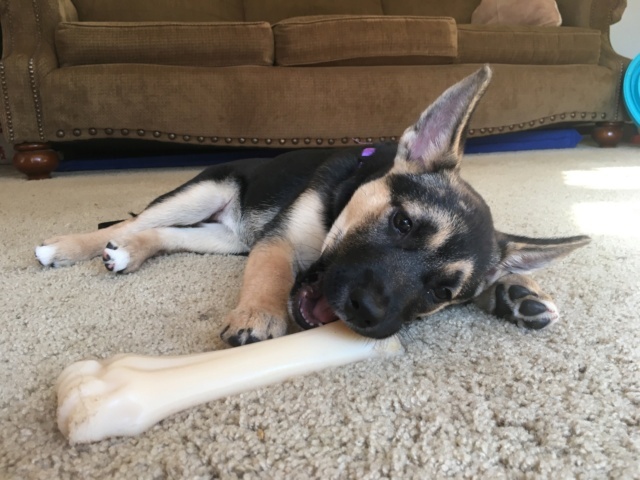 Puppies can be hard to tell, she looks Shepard to me, but as she grows, you might notice other things. She's adorable either way! She's definitely majority shepherd. The white tips on her back toes could be from something else though. Should be easier to tell as she gets older. Mostly Shepherd but I'd also say that there might be some Black Lab in there - and don't ask me for reasons, it's just impression. Do a DNA test!! Those white toes are interesting!!! I'm so curious to see what she grows up to be.... Like I said she's very petite...at 13 weeks the size of breeds like Shepard's when they are 8 weeks at most. She her profile of her head and not reaaal long snout made me think some husky. It's her sleek coat that throws me off. So hard to tell. I had a doberman before her that was 60-65 lbs and joys structure is more of a medium dog but no clue! All I know is she's getting puppyfood, exercise, fun, and love until we find out. I'd love to do a DNA test but wait and see is a little more affordable ????... But even when she is older it would still be helpful if she doesn't makes things easier for me to guess lol. 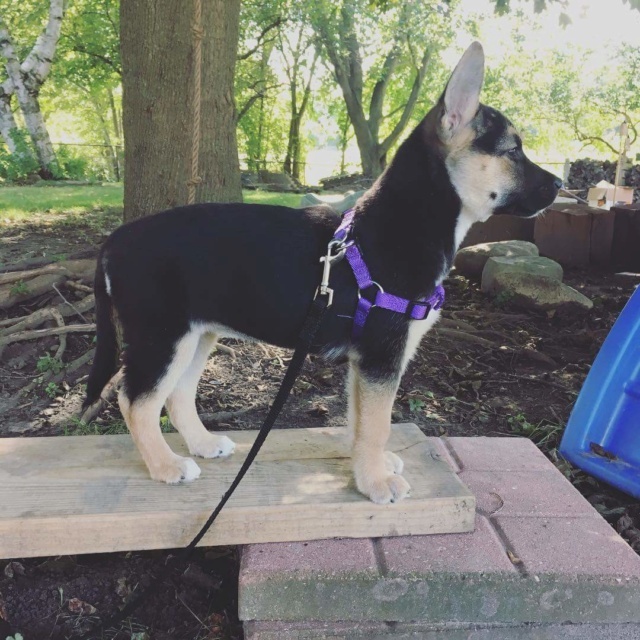 This is her profile standing when she was 11 weeks. She's grown a pound and then some since coming home from the shelter. She's much more strong and steady now. But the minute she puts her nose down to sniff her body language looks like the Shepherd in her. Such a game ???? looks mostly Shepherd, she is cute. l love those white toes. my chihuahua Joey had white toes too. Subject: Re: Joy says hi!